Arizona has to be one of the harshest and arid climates. Living here we have brutally overprocessed water loaded with minerals, dry summers, winters and dust for days. With all of these factors skin can dry, crack and be in a constant state of thirst. Part of my struggles is to find a lotion and or moisturizer that will hydrate and soften my skin without feeling greasy, oily and or dry me out. I have been reading more about using vegetable oils in lieu of lotions. All that being said, for the last few weeks I have been using fractionated coconut oil for my hair and skin. Fractionated coconut oil is just as it sounds; a fraction of coconut oil. Natural products that have minimal to no processing can result in instability as well as something that can spoil in a rather short period of time. Since coconut oil is extremely beneficial for your skin and hair, the fraction of the coconut oil is a pure saturated oil with a long shelf life. The product is a thin, silky smooth oil that is and can be used for a multitude of purposes. For example, the production of soap, lotions, ointments and other cosmetic products. I received a bottle of Bayleaf Botanicals Fractionated Coconut Oil with pump and I could not be more pleased. I love coconut oil to eat and to use on my hair but sometimes I am left feeling a bit too greasy. The fractionated coconut oil is thinner, silkier and I don’t feel like I am using oil on my skin. The oil is also a great addition to my leg shaving routine, perfect for smoothing my fly-away hairs and I can be free to add my own scents because the oil is scent free and odorless. If you are looking to make a change to your beauty and health routine but are leery of using a vegetable oil that you feel is reserved only for cooking, you can rest assured this is not your typical coconut oil. 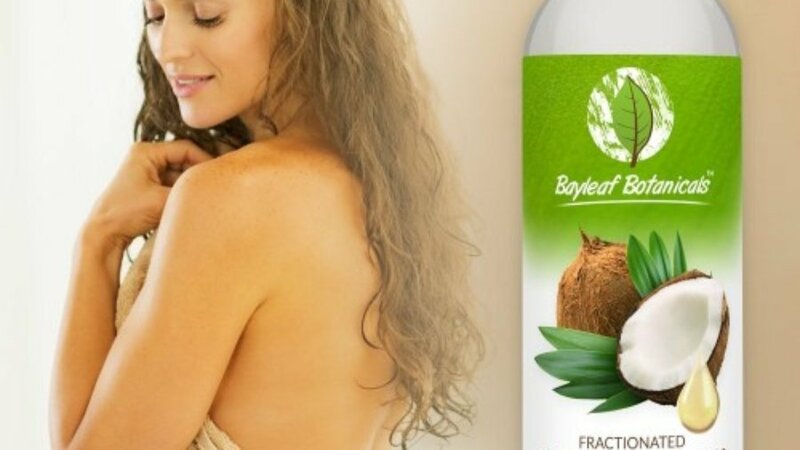 We are giving away one bottle of Bayleaf Botanicals Fractionated Coconut Oil to try in your home valued at $24.99. Disclosure: The bloggers participating in this event have NOT been compensated for this post. The Five Fish % Blondies LLC is not responsible for prize fulfillment; Bayleaf Botanics, Britannia Sunset Holdings LLC will be responsible for prize fulfillment. This event is in no way associated with, sponsored, administered, or endorsed by Twitter, Google, Pinterest or any other social media. If you have any questions or would like help in promoting your own product please contact Karie@TheFiveFish.com. The disclosure is done in accordance with the Federal Trade Commission 10 CFR, Part 255 Guides concerning the use of Endorsements and Testimonials in Advertising. My skin has occasional blemishes and dryness. Perhaps this product may help some. I have psoriasis, and my skin os always itchy, peeling, and just plain awful! I heard that Fractionated Coconut is sometomes helpful for this – I need to try it! I would love to try Bayleaf Botanicals Fractionated Coconut Oil for shaving my legs! I bet it would leave them silky smooth. My skin is aging and dry. This sounds like something I could use to keep my skin hydrated and moisturized. I have dry skin due to Psoriasis and would love to try this to nourish my skin. I would love to keep my skin soft, moist and youthful! I have dry skin on my arms. It is very weird because my face and legs are oily type skin but my arms are ashy and I constantly have to exfoliate and lotion up. My skin is combination and sensitive, so it’s hard to find products that work for me. i have very dry skin. I think think this would be a good hair conditioner too. I like coconut oil for my skin, especially my dry knees and elbows. How does this compare to jojoba oil? Lina, I would say the moisturizing is about the same without the heavy feeling often experienced from Shea or jojoba. Menopause has made my skin dry, flaky, and my face breaks out. I’d like to see if this oil would “calm” my skin. I have dry skin and hair so this would be soothing for homemade beauty products! I LIVE IN AZ. TOO SO I WOULD LOVE TO TRY THIS PRODUCT. I ALSO HAVE HEALTH RELATED DRY SKIN ISSUES THAT MAY BE HELPED BY THIS PRODUCT. I have dry skin and eczema so this would definitely help with my skin. Nothing ails my skin, but my daughter has sensitive skin and I think this could be beneficial for her! I have dry skin, especially my legs. I think this would be a great moisturizer. I tend to get dry skin on my torso. I think that would be perfect! My skin is dry. I swim 3 times a week and would love to use this after swimming. Coconut oil would be great for healing dry skin. I have dry skin from our harsh winters. This would heal it up nicely.